Entries tagged with “Holidays and Special Days”. On a past weekend (12/18-12/21), we went to church 2x’s. Yes I am bit on the overachieving side, but not usually when it comes to listening to sermons while sitting in the pew (or other uncomfortable chair). Friday night was our usual Seward Church gathering and on Sunday we went to Church at the Crossing in Indianapolis, which is where my wonderful wife went to church growing up. Last Monday I shared the message from Seward Church, so today is the one from The Crossing. Steve Rennick shared the Christmas story for us, starting with Luke 2:1-20. Luke gives a special emphasis to the shepherds and the angels in the Christmas Story. The shepherds were minding their own business in the field when out of no where came a ton of shiny angels (vs 8-14) where they were told that they shouldn’t be afraid of the angels. The angels delievered the good news and the shepherds immediately travelled into Bethleham trying to find this baby Jesus upon their arrival they worshipped Him. Knowing that Christmas is incomplete, the next stop is Matthew 2:1-12. The baby Jesus was born in Bethlehem which fulfills the prophesy in Micah 5:2. Steve pointed out that the entirety of Luke’s Christmas story, all 20 verses of it, fits into 1/2 a verse in Matthew 2:1 “After Jesus was born in Bethlehem in Judea, during the time of King Herod.” We traditionally think of their being 3 Magi and 3 shepherds, but there is no Biblical truth to this matter. We get the number 3 because of the three gifts that were brought, but in reality it could have been hundreds of Magi. Another Christmas misconception or at least a nativity misconception is that the Magi and the shepherds visited the manger at the same time. 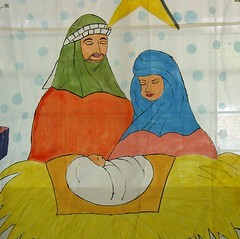 In reality the Magi came at a later date and met the family of Jesus at a home (vs 11). The three gifts gold, frankincense, and myrrh were ultimately used to fund the family’s “exile” in Egypt. Some of these thoughts are new and insightful to me. A third perspective on the Christmas story come from John 1:1-5, 9-14. If you are familiar with the John story, you know it is a very different perspective on the coming of Jesus. Steve called it a more theological or upper perspective. It could be the God view of the story. It tells it straight up with no sugar – Jesus, the Good News, has come into a dark world to shine light and bring peace. The final and shortest part of the Christmas story is from Mark 1:1. It offers no information other than that Jesus represents the beginning of many good works! God, what do you want to do through me, what do you want to do to me, and what do you want to do in my life? He suggested we dream big and set no limits, just wait, pray, and see where God takes you. 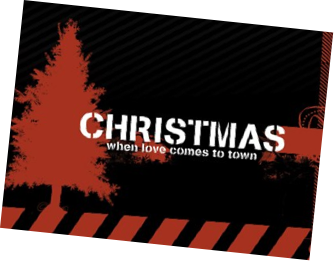 It is an interesting connection, using the Christmas story to challenge us for the beginning of 2009. I have trouble recalling it and tying it all together but you can listen to it here (sometime soon). We don’t celebrate a traditional advent at The Bridge. In the last three years that I’ve attended (and its existed) this has made for a different holiday season than I’m used to. This week Chris’s message was excellent and Bono even paid a short visit! I must say it was a little interesting using Jonah as the basis for the Christmas story, but it tied in very nicely. The main point of the message was that we should love people rather than judging or condemning them. God does not want His people walking around the earth holding His love inside their hearts or in some niche group and condemning everyone else. Look what happened to Jonah when he tried. Matthew 5:43 commands us to love our enemy and pray for those who persecute us. That definitely isn’t an easy task and it should be done in a healthy and Spirit-filled way. Chris made a point at the beginning to say that we are often more charitable this time of year, than during the other 11 months. He clarified that God wants us to live with love 24/7 all year long. Make a list of people or situations that you need to let go of and focus more on loving those people instead of harboring ill feelings or judgement. Pray for God to help you to do this. Adventures and Thoughts of Team Cross is powered by	WordPress 4.3.19 and delivered to you in 0.486 seconds using 36 queries.